Get everything you need to analyze, draft, present, and execute a contemporary living trust in any of its many forms and constructions. Drafts drawn up with practice-tested forms on disk, and the sample client letters, wills, and graphically-illustrated procedural charts will ease your task and lend confidence in the resultant document. 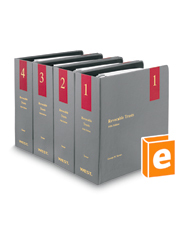 All the "pros" and "cons" are at your fingertips in these volumes, including a comprehensive survey of estate planning trusts, income tax implications of estate planning trusts, asset calculations for trust transfers, and all necessary forms.